It was the Bates senior thesis she wrote about Buddhist monuments in the Himalayas that put Natasha Kimmet ’07 on her career path she’s on today. “The art, architecture, culture and landscape of the region resonated with me,” says Kimmet, a Bates art and visual culture major who is now a doctoral candidate in art history at the University of Vienna and a curatorial fellow at a New York museum dedicated to Himalayan art and culture. For Christina Saunders ’06, another AVC major (paired with English), the senior thesis was a way to harmonize two of her passions, law and the arts, as she researched issues around the wholesale looting of art by the Nazis during World War II. Today, as a partner in a Denver law firm, she specializes in cases involving intellectual property and the arts. Saunders and Kimmet returned to Bates in separate November visits to talk about their careers and Bates’ role in getting them established. Saunders, now a partner at Denver law firm Sparkman + Foote, earned a law degree at the University of Utah’s Quinney College of Law. 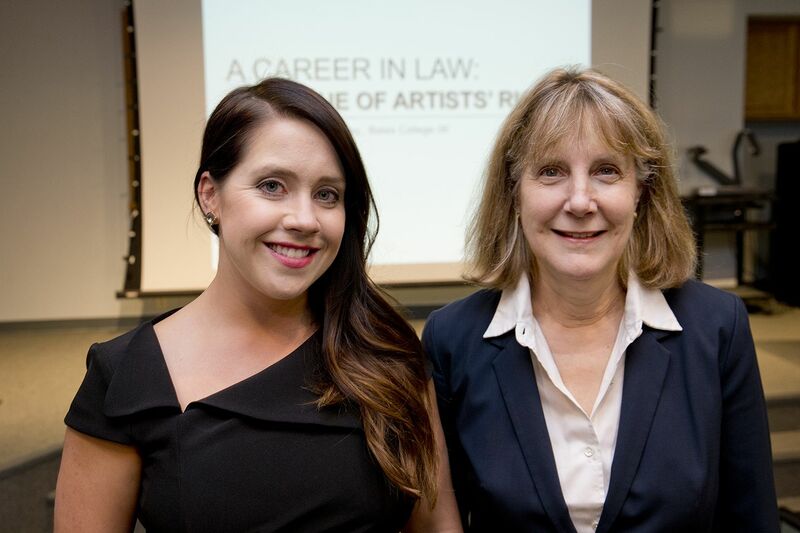 Her Nov. 4 talk ranged from her Bates experience, to the inherent difficulties in defining “art law” as an area of legal practice, to her current legal work. For example, Saunders routinely draws up agreements governing the licensing or consignment of a visual artist’s images. She also represents artists in disputes, such as misappropriation of an image or nonpayment for the sale of a piece. “I’m the only attorney in Denver doing this work,” she says. Kimmet has been a curatorial fellow at New York City’s Rubin Museum of Art since January. 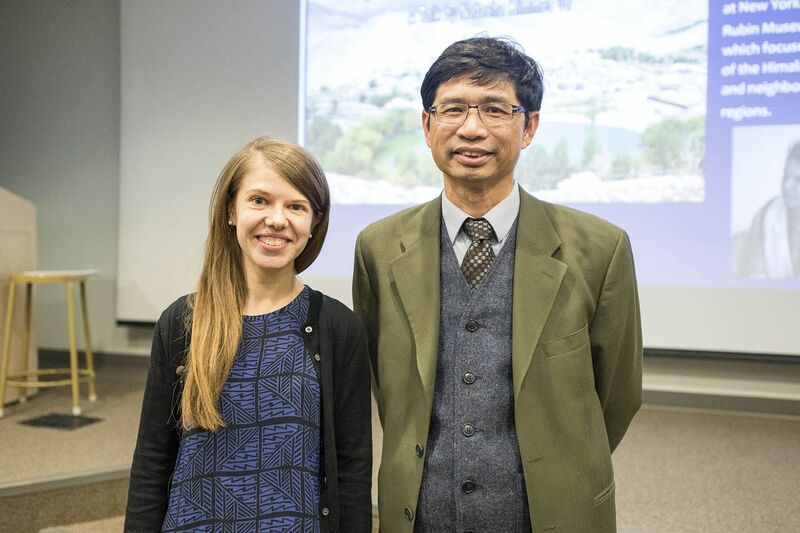 In her Nov. 12 Bates talk, based on her dissertation research, she used a village called Nako in India’s Himalayan mountains as the starting point for a discussion of the region’s residential architecture and how it expresses Buddhist practice. Centuries-old dwellings in Himalayan villages captivate scholars and tourists, as well as their inhabitants, “because of their picturesque, ‘authentic Himalayan’ character,” Kimmet says. Yet scholars have largely neglected these secular buildings in favor of the region’s Buddhist monuments — the topic of Kimmet’s own senior thesis, in fact. With Rebecca Corrie, Phillips Professor of Art and Visual Culture, as her adviser, Saunders used senior thesis to explore the value, in diverse senses, of art in the context of World War II in Europe. “The topic really catered to both interests of mine.” It enhanced her experience that news about stolen artwork was making headlines at the time — one of the cases Saunders looked at was that of Maria Altmann, whose struggle to retrieve looted artwork from the Austrian government was depicted in the 2015 film Woman in Gold. Advised by Associate Professor of Art and Visual Culture Trian Nguyen, an authority on Buddhist art and architecture, Kimmet devoted her senior thesis to the evolution and community role of “stupas,” monuments that symbolize the mind of the Buddha, in northern Nepal. After Bates, she earned a master’s at the University of London’s School of Oriental and African Studies. She began her current role as curatorial fellow at the Rubin last January. Her work has included developing her own exhibition about the representation of architecture in central Tibet through historical paintings and photographs. “Bates prepares its students for careers, as well as life more broadly, in ways that we are continually discovering,” says Kimmet.